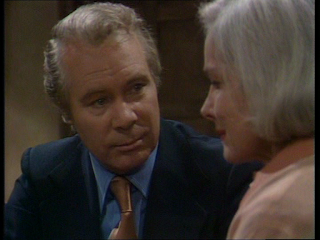 I have written before about how I have thought some of Nigel Kneale’s work is sometimes hit or miss. I think I was badly burned when I last watched Beasts and I looked at the episode Buddyboy. There were so many components to that story that were so polar opposite of each other, it was really difficult for me to enjoy it or understand how it should fit together. I thought it was such a stretch. That was last year and now I am back to take a look at the Beasts episode, During Barty’s Party. This was such an enjoyable viewing experience for me. 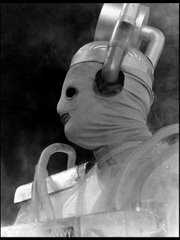 There is so much to like about this episode and to me, classic Nigel Kneale. I will explain exactly what I mean by that statement later in this article. On Wikipedia the description for this episode in their Beasts episode guide is simply, “a middle-class couple's life becomes overturned by rats.” Although technically it’s true you could also say the description for the 1939 MGM classic, The Wizard of Oz is about a girl who gets hit in the head and has a strange dream. My point is this: just like The Wizard of Oz, During Barty’s Party is something really special. 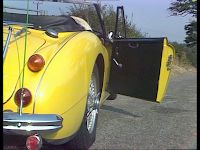 The episode starts out on a shot of a yellow car with its door open. Then the screaming begins. So much so that it wakes up Angie Truscott from a mid-afternoon nap or was she dreaming about screaming? There is something wrong with her. Angie is extremely nervous. Something has happened to her in the past though we never know what it is. She doesn’t like to be alone and it appears her condition is getting worse. Her husband Roger comes home for the day from work. They are both middle-aged and live in a nice suburban house. Almost immediately when he gets home, Angie alerts him to the fact that they have a rat. A rat is chipping away underneath the floor boards. It is clear that Roger has needed to be patient for a while with whatever was happening to Angie. It is not that Angie is annoying or unreasonable; I think it is more to do with Roger being such an overly-rational person that he just does not have the patience for that type of illness because he doesn’t understand it. Angie tells him about her day and how she did go out for a while. She also tells him about her nap she took and woke up to hearing screaming. Roger is not spooked about rats the way that Angie is and handles it like a “man”. He’s going to show the rat who is the boss in the house! The episode takes an interesting turn when Roger gets a phone call from Peter Newell. Peter is a business associate with Roger. 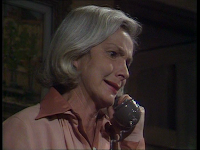 Angie can hear the phone call when Peter tells Roger about reports of a large pack of rats in Angie and Roger’s area. Apparently they are roaming around and people are being told to stay out of the rat’s way. Freaked out, Angie puts on the radio and a popular show is on called Barty’s Party. It becomes clear that there is more than one rat under the floor, in fact a few of them. Even Roger is starting to get a little freaked. I think what is interesting about this episode is that the roles become reversed between Angie and Roger. In the beginning Roger is the one speaking common sense about the situation. He knows that rats are not going to roam on open roads in public and whatever is happening to the Truscott’s is Angie’s imagination. Clearly it is just a small rat problem, right? As the episode progresses, the Truscott’s hear more reports on Barty’s Party about other people who have seen these rats and all of the sightings have been right by where the Truscott’s live. Although Angie is terrified of basically everything through the episode, it is her that starts to realize what is happening. She believes these rats are super intelligent rats. Angie demonstrates it by making noises on one part of the floor where the rats follow the sound to that area and begin gnawing away but then she makes noises on another area and you can hear them run over to where she is making noise and they start on that area. It is clear that these rats are not content to do anything but get to them. The more Angie pieces the evidence together, the more Roger loses it. 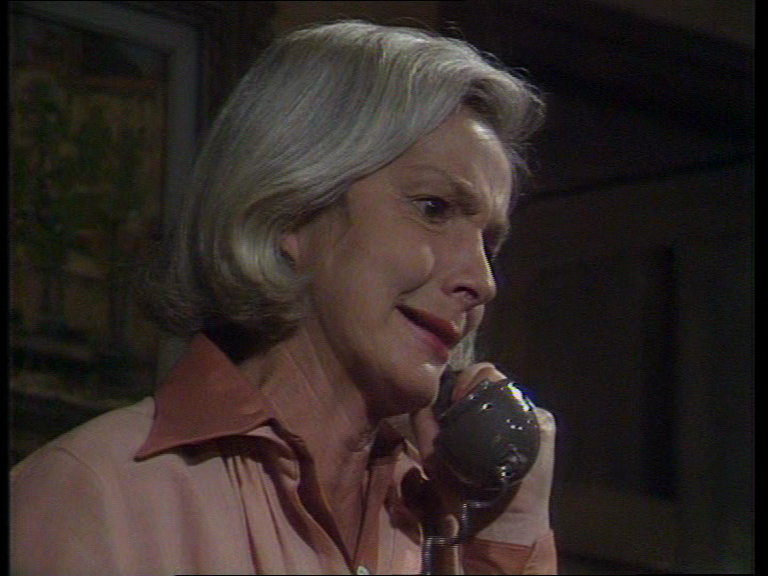 The moment, for me, where Roger has become as frightened as Angie is when Angie calls into Barty’s Party. She gives them her name and they put her on the air with Barty. At first he doesn’t believe her but as she tells him what is going on, her terrified voice is enough to get Barty to believe her. As he asks her for her address on the air to get police over to them to help, the phone service goes out. The rats chewed through the phone wires! Angie and Roger are horrified but luckily Barty says on the air that even though she is cut off they will get police to figure out where she is because they have her name and can find her: Angie Prescott. Her name is actually Truscott. Barty got it wrong and they will never find them. Throughout the episode, the sounds of rats get increasingly louder and suddenly I realized that the sound of the rats is over powering. Just as Angie and Roger are about to try and escape, their neighbors the Gibson’s come home. We never see them; this all happens from outside of the Truscott house. As Angie and Roger speak with them from their window, they have a moment of happiness thinking that everything was alright. Perhaps their imagination is getting the better of them plus the sounds of the rats are gone. Suddenly, we hear the sounds of rats attacking the Gibson family. All of them and killing them all. Ultimately, Angie and Roger hear the rats come back and finally we hear the rats attacking the Truscotts. 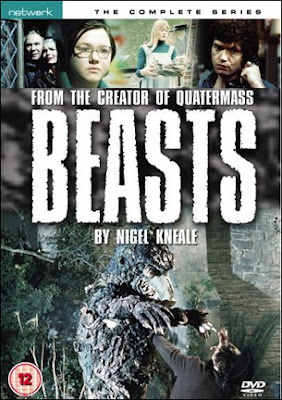 Beasts is an interesting premise for a TV series but was one that Kneale was always fascinated with exploring. In the DVD notes for this series Andy Murray says this premise is “civilized man in conflict with the primal, animal side of existence”. This works extremely well in During Party’s Party. I think why it works so well is that it is a very straight forward story. It is exactly what the Wikipedia entry I listed above says except how the story is executed is what makes this piece very noteworthy. 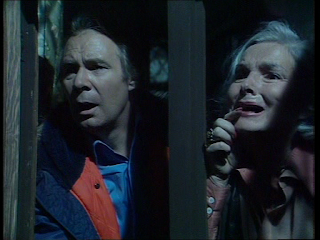 I also said this is classic Nigel Kneale. I don’t mean that in terms of necessarily a specific style. This whole episode succeeds based on the two actors we see on screen, Elizabeth Sellars and Anthony Bate, making everything believable. The whole episode is about a massive rat infestation yet we do not see one rat on screen. The whole thing is done based great sound effects and the acting of the two characters. To me, I think this is very similar to what Kneale had to write in the very early days of television. I even note it in my article for episodes Five and Six of Quatermass II. It was a live production and the stuff that would be visually difficult to do in a live low budget setting was done off screen and it was up to the actors to convey the threat on screen. Here we have the very same situation. Things we see off screen are the deaths of the Gibson family. It is horrible but we never see it. We only see the Truscott’s reaction to this. 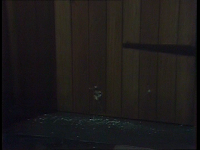 The closest thing we see to a rat is the scene where they are chopping their way through the back door. It almost looks like teeth chomping through but it isn’t; it adds to the frenzy the episode reached. 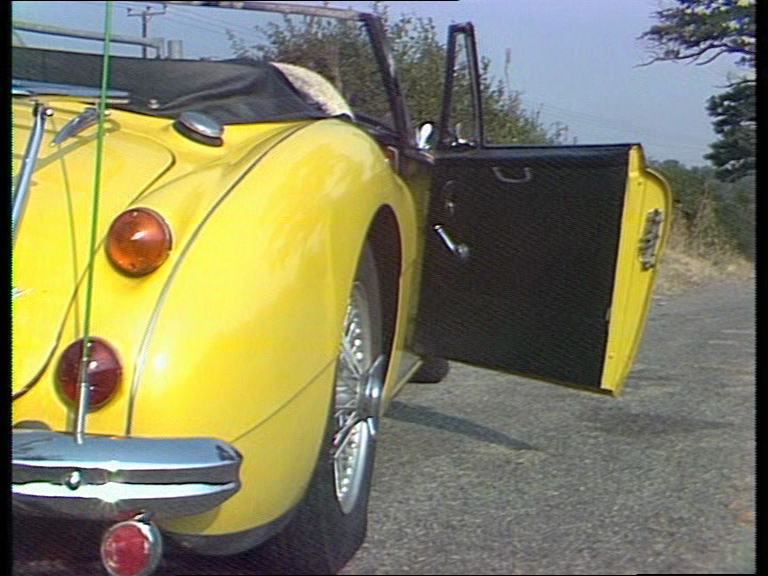 I think the creepiest visual for me is the car at the beginning of the episode. We only see it in the first shot yet Angie looks out the window and talks about it a few times. She mentions how it hadn’t moved the entire day and now it is night. While looking out the window she mentions the moonlight shining off it and she still see the car door just hanging open. Maybe it is creepy for me because I knew those screams were not something Angie dreamed about at the beginning of the episode. Plus there is something creepy about something that looks normal but you know it isn’t. This is the second time I had seen this episode and I really enjoyed it more the second time through. The first time I had no idea what the episode was about and wasn’t sure if I was going to see one of those episodes where maybe the husband or the wife was going to go mad and murder the other spouse. I had no idea it would be about rats. Although it takes it’s time to build itself up, the episode moves really quickly. I thought I was only about five minutes into it but when I looked at the clock, twenty-five minute had passed. As I mentioned above, although Angie is terrified of so much throughout the episode she is the one who pulls her and Roger together to actually try and escape from the house. When the problem seemed to be just one rat in the house, Roger was very much in control and was losing patience with his wife for overreacting. Once he realized that Angie was right about the rats, he crumbles into hysteria. Angie tries to get them to leave but he is too frightened to even move. 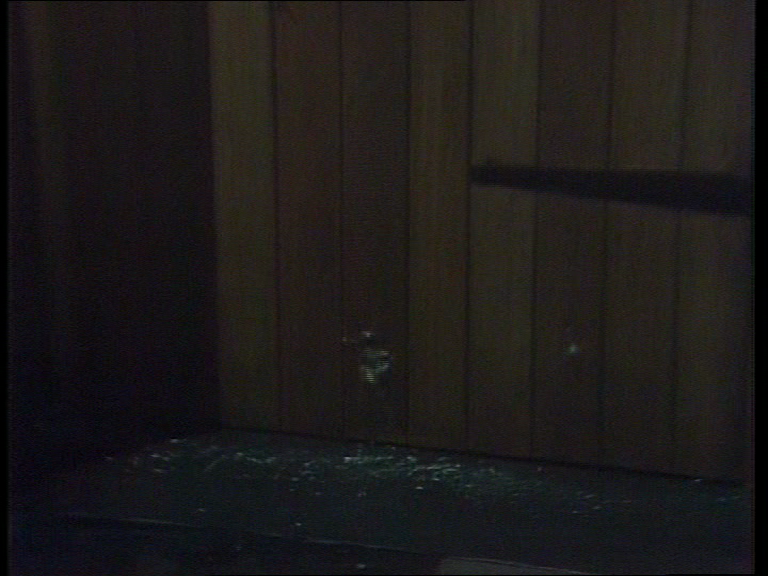 The last shot of the episode the empty room with only the sounds of the rats and the Truscotts screaming in the background. If you are good at recognizing voice (or good at reading closing credits) you will notice that the voice of Peter Newell is John Rhys Davies. Of course, Davies has gone on to have a tremendous film career being in some of the Indiana Jones films, the James Bond film The Living Daylights and the TV series Sliders plus so much more. The episodes on the DVD set must be presented in production order although I do not see it listed as such anywhere. For years I thought During Barty’s Party was the last episode of the series but according to other sources such as the Kaleidoscope ITV Drama Guide, it is listed as the first episode. Those transmission dates are from the HTV West Region broadcasts but I think it was similar in most areas. It’s too bad because I think this would be an amazing way to end to a great series. Then again, it is also a chilling and strong start to a new series too. I guess it works either way. Next week: As I move into the Christmas season, I devote all of the programs I watch during December to Christmas themed episodes. I really do not collect American television but I am a big fan of animation. I will look at episodes of Family Guy next week. In particular I will write about A Very Special Family Guy Freakin’ Christmas but also go on a rant about their strategy of releasing DVDs. 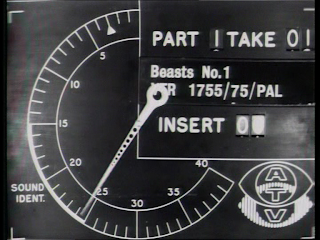 I really loved this series from first transmission in 1976 (aged 9), when I first became ware of Kaleidoscope and started communicating (through snail-mail, back in the day) with Christopher Perry he informed me their trail of the ATV archives had no episodes of "Beasts", and all the 2" Quads were wiped. However he wrote back saying all the Quads were still there and misfiled under wildlife documentaries, if it weren't for Kal some tech might have just wiped the lot! Thank you for reading the article. I never knew that about Beasts. I agree, I think it would be British television's loss if there was no Kaleidoscope. Missing Belived Wiped is this weekend. Of course I am no where near where it will be, it still pretty exciting! Speaking of missing material, I think we are lucky the unofficial pilot for Beasts, Murrain, exists. A couple of episodes of Against the Crowd are missing and it easily could have been Murrain. 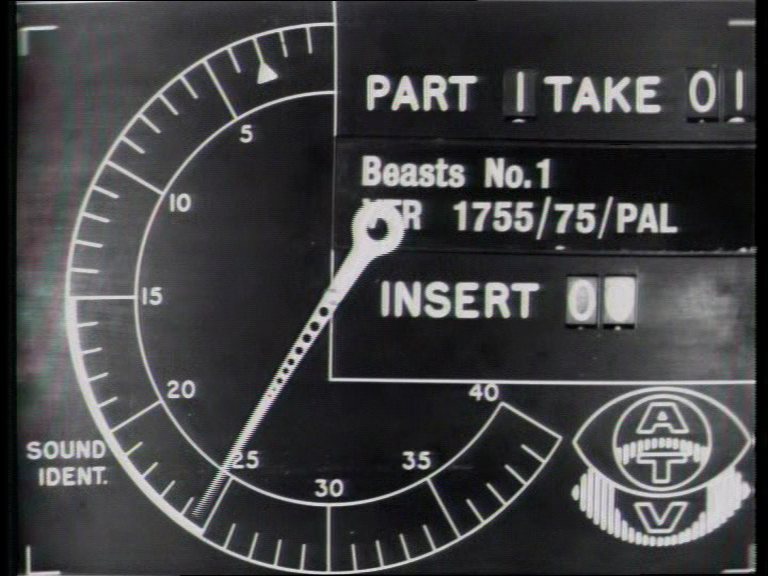 Beasts really was hit-or-miss when I finally got around to watching the run of episodes. Buddyboy had potential but was very disjointed, and I thought was the low point. The other episodes ranged from OK to good to very good, and During Barty's Party was the real high point. Yet another great read from the Gregbert! Thank you Sir Dave! It truly is high praise indeed! I'm glad you are reading these articles, I actually have you in mind when writing them. As you may have seen my Buddyboy article,it really reinforced to me that when Kneale was bad, he was really bad. I feel like I am speaking blasphemy as just about every one reveres him. Then you look at something like During Barty's Party and it truly doesn't get any better than that. It is so easy to want to show everything in a production. If the script called for rats, let's get in rats! I applaud the proudction team to allow the story to actual tell the story. Let us visually imagine the scene of the family be devoured by the rats. Love it! If you're looking for more rat-related fun from Kneale, you should read "The Stocking" in his collection "Tomato Cain and other stories". A good time to do this would be Christmas Eve. Thanks for the tip. I certainly know of "Tomato Cain and Other Stories" and I probably should seek it out.